After setting up your google merchant account, to let your product ads go live, you will need to connect your Google Merchant to the Google Adwords account and adjust your bidding to optimize your shopping campaign. 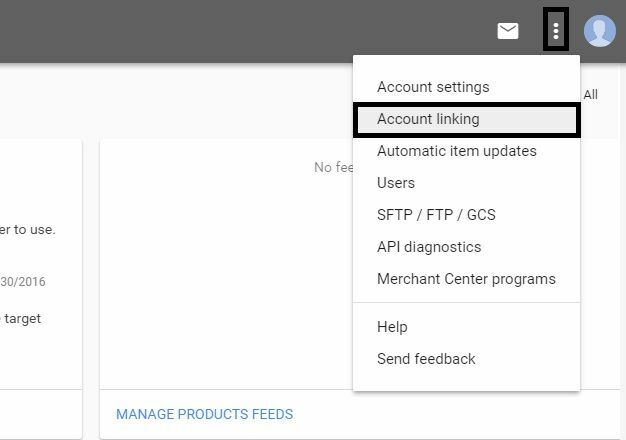 To link your Google Adwords account, click on the option icon at the top left of your Google Merchant account and click on the Account Linking on the drop-down. Then you will be taken to a page where you will have the option to add your adwords account. If you have an existing adwords account then click on (+) sign below Other Adwords Account. At the Adwords ID enter the id of your adwords which will send an approval link to the associated adword user email. If you do not have an adwords account yet, you can directly start to create your Adwords account by clicking on the (+) sign below Your Adwords Account. Now here is the idea that most of the merchants fail to implement. Simply advertising on Google Shopping will not give you the results that you actually want. You need to optimize your data feeds according to the market trend. So, what are the cheats that you can use to boost your sales? Many experts recommend to add the core identity of your product on the beginning of your product title. But this doesn’t mean that you should not include the indications about brand or such features. It is highly recommended that you understand how your product is searched and place those keywords on the beginning of your product title. Though optimizing your product description has less impact than optimizing the title, it is just wise to optimize this for the potential customers. Make sure to add the best value propositions of your products including the keywords that you target to rank for. The shopping campaign in Google Adwords will have the products that you added in the Google Merchant center. After you have the products in adwords, you will be able to easily manage your target Shopping Campaign. You can adjust your settings, ads, keywords It is just obvious that setting a higher bidding on your keywords of shopping campaign will secure you a higher position than your competitors. Though it may be a factor increasing your cost per sales, staying behind your competitors will not help you generate the revenue you desire. There are certain compulsory attributes that you need to provide in your feed file based on the category of product. Along with that, there are those optional attributes too which many people neglect. Providing these optional attributes will increase chances of your product being found when potential customers are conduct search using filters. – Use 150 characters to include brand, gender, color & size type. – Ads can be clicked due to curiosity but doesn’t necessarily lead to conversion, so clarity is always the best bet. Start with the most important products; optimize the information & images for the products that you are focusing to sell more. If you have any questions regarding the process of creating feeds or selling your prodcuts through Google Merchant, feel free to contact us at ExportFeed.